The McCanns have entered a process of self-flagellation. The circus they built around themselves since their daughter's disappearance is starting to turn against its creators. Now they gave an interview to Tele3. Organized, studied questions, a docile interviewer and the same words again and again. Not a single explanation concerning their daughter's whereabouts. A round conversation, lacking nexus, filled with commonplaces, of ready-made sentences, but not a single word about the reason that led them to abandon three children in a foreign apartment, without a person watching over them. For two months, the favourite circus act was the abduction theory. Sky News was called before the authorities, the world's press, the political authorities in both countries, even the polices, cried in one voice: abduction! Find our daughter. Never before had so many people been searching for one child, throughout the entire world. But the story that had been proclaimed as true, unique and inequivocal, had been poorly told. A sketch that was drawn under the directions of one of the main witnesses was the motto and the motive. 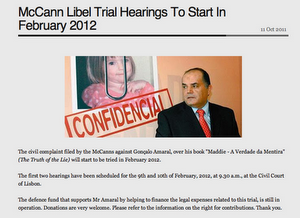 Now we find out, through the McCanns' publicity machine, that it is nothing more than the sketch of a cartoon character. It could be the character of captain Haddock or Tintin or the kidnapper in any of their cartoon stories. And the huge team of private detectives, aides, advisors, consultants, insist he is somewhere in Spain, Portugal or Morocco. Why? What is the basis for this? What objective, or subjective, reasons lead to this belief? I cannot understand how experienced lawyers allow this frightened couple, who watch their credibility fading away on a daily basis, to continue to produce this ritual of sorrow that hurts those who watch them, and listen to them, as they do not answer. They don't answer the police because they are arguidos and have the right to remain silent. To the newspapers, they condirion the questions that they want to answer, and they use pink journalists for the acts that they stage. And when they shut up, they mobilize their allies in order to elongate the act. But concerning the facts, not a single word. Nobody doubts that they are suffering. Few have doubts about the truth that they refuse to answer to. It will take some time for this case to leave the newspapers' front pages, and exceptionally neither the Portuguese nor the British police are the vehicles of the news. 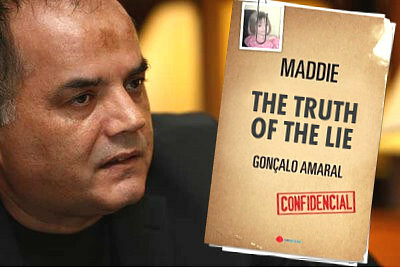 The McCanns have stopped looking for Madeleine. They are forcibly trying to convince us that they had nothing to do with her death. Because they are innocent? Maybe. But this is not the way - evading the essential questions, staging tears and cries, refusing to answer the more agressive questions - that they manage to convince anyone of their innocence. Quite to the contrary. And do not say that it is the judicial secret that prevents them from telling the truth. When we are innocent, we scream our sorrow into the depths of hell. We do not built propaganda circuses of poor taste.